Dr Leafs social media gem gave me an eerie sense of deja vu. It was only the end of October when she posted the same factoid on social media. Today’s version has been tweaked slightly, although in all fairness, I can’t describe it as an upgrade. On comparing the pair, Dr Leaf has added “brain” into the number of cells under the influence, and then massaged the opening slightly. I already had significant concern about the scientific validity of the previous meme in October. That hasn’t changed. Rather than improving the accuracy of her meme, Dr Leaf’s changes have left it missing the mark. The fundamental fallacy that thoughts are the main controlling influence on our brain is still there. Thought is simply a conscious projection of one part of the overall function of our brain. Our brains function perfectly well without thought. Thought, on the other hand, doesn’t exist without the brain. Our brain cells influence our thoughts, not the other way around. The myth of “quantum speeds” is still there. Our neurones interact with each other via electrochemical mechanisms. Like all other macroscopic objects, our brains follow the laws of classical physics. It’s not that quantum physics doesn’t apply to our brains, because quantum mechanics applies to all particles, but if you think you can explain macroscopic behaviour using quantum physics, then you should also try and explain Schrodingers Cat (see also chapter 13 of my book  for a longer discussion on quantum physics). Dr Leaf is particularly brave to make such bold statements about quantum physics when even quantum physicists find it mysterious. What made me slightly embarrassed for Dr Leaf is the new part of her statement. In my blog on Dr Leaf’s previous attempt at this meme, I pointed out that Dr Leaf’s estimate of the number of cells in our body was more than three times that of the estimate of scientists at the Smithsonian (http://www.smithsonianmag.com/smart-news/there-are-372-trillion-cells-in-your-body-4941473/?no-ist). The fact that Dr Leaf so badly estimated, when all she needed to do was a one line Google search, suggested that she just made the number up. Failing to cite her source eroded at her credibility as a scientist. 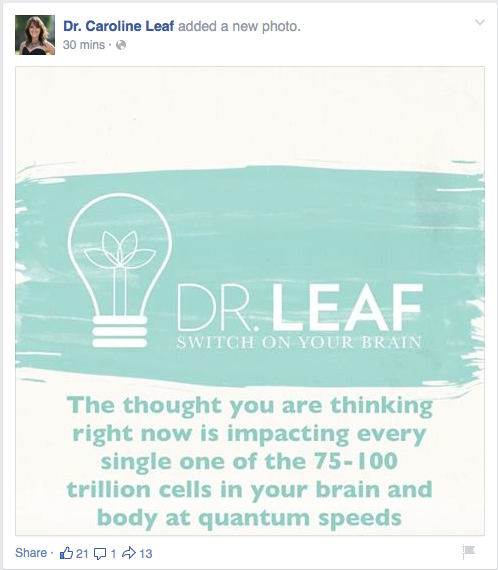 Today, Dr Leaf still claims that there are 75-100 trillion cells in the brain and the body. The Smithsonian still hasn’t changed its estimate. Dr Leaf still hasn’t cited her source, and has ignored a world-renowned scientific institution. Perhaps Dr Leaf believes she knows more than the scientists at the Smithsonian? Perhaps she has a better reference? We’ll never know unless she cites it. Taken as a whole, her meme is no closer to the truth than it was six weeks ago. Some may ask if it really matters. “Who cares if we have 37.2 trillion cells or 100 trillion cells or even 100 billion trillion”. “So what if our thoughts influence us or not.” If this was just a matter of a pedantic argument between some scientists over a coffee one morning,then I’d agree, it wouldn’t be so important. But Dr Leaf claims to be an expert, and more than 100,000 people read her memes on Facebook and many more on Twitter, Instagram, and the various other forms of social media she is connected to. Nearly every one of those people take Dr Leaf at her word. Ultimately the issue is trust. If Dr Leaf can misreport such a simple, easily sourced fact, and not just once but twice now, then what does that mean for her other factoids and memes that she regularly posts on social media? If Dr Leaf incorrectly says that every thought we think impacts every cell in our body, then hundreds of thousands of people are wasting their mental and physical energy on trying to control their thoughts when it makes no real difference, and if anything might make their mental health worse [2, 3]. This is more than just a pedantic discussion over a trivial fact. These memes matter to people, and can potentially influence the health and wellbeing of many thousands of lives. Peter Parker, quoting Voltaire, said, “With great power comes great responsibility.” Just because Spiderman said it doesn’t diminish the profundity of that statement. This law of great power applies to Dr Leaf as much as it does to Spiderman. I hope and pray that she gives this law of great power the consideration it deserves. This entry was posted in Biological, Caroline Leaf, Psychological and tagged brain, caroline, caroline leaf, cerebral cortex, cognitive neuroscientist, criticism, dr caroline leaf, Dr Leaf, Facebook, Leaf, meme, memory, neurobiology, peter parker, pseudoscience, psychology, quantum, quantum mechanics, quantum physics, smithsonian, spiderman, stress, thought, toxic thought, voltaire by cedwardpitt. Bookmark the permalink. this is very stubborn and outdated thinking, and honestly kind of stupid. if thoughts didn’t have any influence, there wouldn’t be a such thing as a placebo effect. just as in so many other biological processes, it works both ways. our brain influences our thoughts, and our thoughts influence our brain. Thanks for your comment. I agree, Dr Leaf’s assertions are “very stubborn and outdated thinking, and honestly kind of stupid”. Though I disagree with your other assertions – the placebo effect doesn’t prove that our thoughts influence our brain. The placebo effect shows that we are remarkably good at subliminal confabulation. Our thoughts are simply the conscious awareness of a sliver of our brain activity. Our thoughts reflect but do not influence our brain activity just like the speedometer of my car reflects but doesn’t actually influence the speed of my car. Happy New Year, and all the best to you.